It will be interesting to see what shape it's in internally. They are usually not that hard to fix. It's the outsides that are often banged around but not with this one it would seem. Hi all! 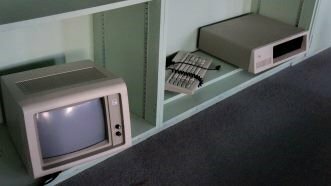 It has been quite a long time since I have posted on the forum, I am still waiting on the IBM 5150 but I have rung the owner again and he said to call back in mid November. I have managed to acquire 3 ZX Spectrum machines from a good friend, all for free too with some games, one 16K works flawlessly, one 48K works fine but needs a new keyboard membrane, the other one which I believe is a 48K and needs a new 7805 voltage regulator as it is only reading 0.84V on the output when it should be 5V I got the original polystyrene box and also a Quickshot joystick and the RAMturbo interface and a bunch of pirated games recorded on 90 min tapes. http://imgur.com/RxJAVmc that is a image of all the spectrums I got! now thats awesome. love the spectrum. the all black case is mean. may not have been the best system but they look amazing. the styling of the spectrum+ is the best. same with the ql amazing looking.